FIORINA: The truth is this. The federal government isn't doing its job. It's the federal government's job to secure the border. The Obama administration has defunded securing the border. And while Barbara Boxer stands up and challenges the constitutionality of the AZ law and vilifies the people of AZ, what she should be doing, what I would be doing, is figuratively standing on the president's desk and saying, Mr. President, the federal government needs to do its job and secure the border. The fact is, between 2007 and now, while spending on border fencing has gone down, overall spending on border security has increased. Let's get to some numbers. The 2011 proposed budget, for example, includes $94 million to expand the number of Customs and Border Patrol officers -- putting the country on target to reach Bush's goal of 20,000 officers. Between 2007 and 2011, the Border Patrol budget increased from $2.3 billion to $3.6 billion. The budget for inspections at ports of entry increased from $1.8 billion in 2007 to $2.9 billion in 2011. In addition, Obama's proposed 2011 budget calls for $1.6 billion for customs enforcement programs to identify and remove illegal aliens who commit crimes; and $137 million to expand immigration-related verification programs. "I would not say the Obama administration has cut back on border enforcement in general," said Marc Rosenblum, senior policy analyst at the Migration Policy Institute. Rather, Democrats have shifted funding from border fencing to other border security items, such as increasing the number of border patrol officers. "Most immigration experts will tell you that adding personnel is much more important than additional fencing," Rosenblum said. "No one thinks building fences, in and of itself, is very effective." But when Pence said "this administration and this Congress have been systematically cutting funding to border security since the Democrats took control," that's wrong. Funding for fencing is down, but funding for border security is up. In fact, discretionary spending on border security is up 55 percent between 2007 and 2011, even with a small proposed cut in 2011. We rate Pence's claim False. FIORINA: It is true I managed Hewlett-Packard through the worst technology recession in 25 years. And in those tough times we had to make some tough calls. It is also true that net-net we created jobs. We doubled the size of the company from 44 billion to 88 billion. We tripled the rate of innovation to 11 patents a day. We quintupled the cash flow. ...And The Merger She Claims Provided A "Net-Net" Growth Was Described As "Disastrous" And "A Flop"
FIORINA: And may I just say, it was Ken Salazar who put in place the Secretary or the Head of MMS, who just recently resigned, and who came from the industry. DEBBIE WASSERMAN SCHULTZ: No she didn't. WASSERMAN SCHULTZ: She came from the house. WASSERMAN SCHULTZ: Liz Birnbaum? Came from the House. FIORINA: --and efficient and effective response. PENCE: This administration did not send cabinet-level officials to the region until 10 days after the explosion occurred. It would be two weeks after the explosion occurred that we began to hear from members of uh, of Congress from the region, that you literally had fishermen uh, standing on, on docks, you had parish presidents who were waiting for BP to give them permission to go out and deploy boom uh, to uh protect their wetlands and their coastline. Then we began to hear from Governor Bobby Jindal about a delay in permitting for the construction of barrier islands. I think what's become clear to people at every end of the political spectrum, and now even on the editorial pages of the New York Times, is that this administration was slow to respond, and continues to fail-- well, continues to fail to provide the kind of energetic leadership that the American people expect, and Candy, that the law demands. The U.S. Coast Guard launched a major search effort Wednesday for 11 people missing after a "catastrophic" explosion aboard an oil rig in the Gulf of Mexico engulfed the drilling platform in flames. The Department of the Interior, MMS [the U.S. Minerals Management Service], and the Coast Guard continue to support the efforts of the responsible parties to secure all potential sources of pollution. Both federal agencies have technical teams in place overseeing the proposals by BP and Transocean to completely secure the well. Until that has occurred and all parties are confident the risk of additional spill is removed, a high readiness posture to respond will remain in place. Although the oil appears to have stopped flowing from the well head, Coast Guard, BP, Transocean, and MMS remain focused on mitigating the impact of the product currently in the water and preparing for a worst-case scenario in the event the seal does not hold. Visual feed from deployed remotely operated vehicles with sonar capability is continually monitored in an effort to look for any crude oil which still has the potential to emanate from the subsurface well. "From what we have observed yesterday and through the night, we are not seeing any signs of release of crude in the subsurface area. However we remain in a 'ready to respond' mode and are working in a collaborative effort with BP, the responsible party, to prepare for a worst-case scenario," Landry stated early Friday morning. PENCE: This is an administration uh, that is, that is uh, groping for some economic policy. 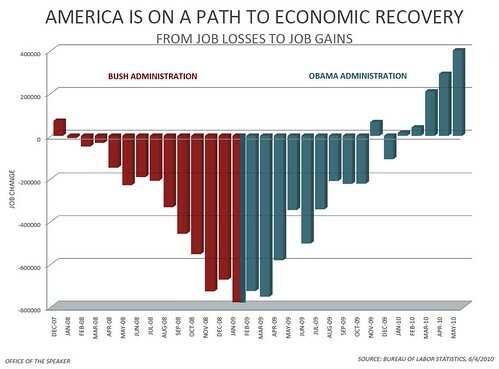 I mean, the truth is, the President likes to talk about the failed economic policies of the past, the truth is, the economic policies of this administration and this Congress are the failed economic policies of the present. Job Statistics Trend Shows Recovery Act Is Working. Below is a graph prepared by the Speaker's office showing not job gains or losses per month since December 2007. PENCE: We need fiscal discipline in Washington, D.C. We need to abandon this spending approach to stimulus, adding to deficits and debt, and we need to provide immediate, across-the-board tax relief for working families, small businesses and family farms. We need a new approach. FACT: The Recovery Act DID Provide "Across-The-Board Tax Relief For Working Families"
Under the stimulus bill, single workers got $400, and working couples got $800. The Internal Revenue Service issued new guidelines to reduce withholdings for income tax, so many workers saw a small increase in their checks in April 2009. The tax cut was part of Obama's campaign promises. During the campaign, Obama said he wanted $500 for each worker and $1,000 for working couples. Since the final number was a bit less than he promised, we rated his promise a Compromise on our Obameter, where we rate Obama's campaign promises for fulfillment.